Before we set foot into 2019, 3.9 billion people or about 51 percent of the global population will be using the internet, according to estimates by ITU, the United Nations agency for information and communications technology. The agency’s previous study estimated that 48 percent of the global population used the internet in 2017. According to the group’s estimates, internet adoption has steadily increased globally. 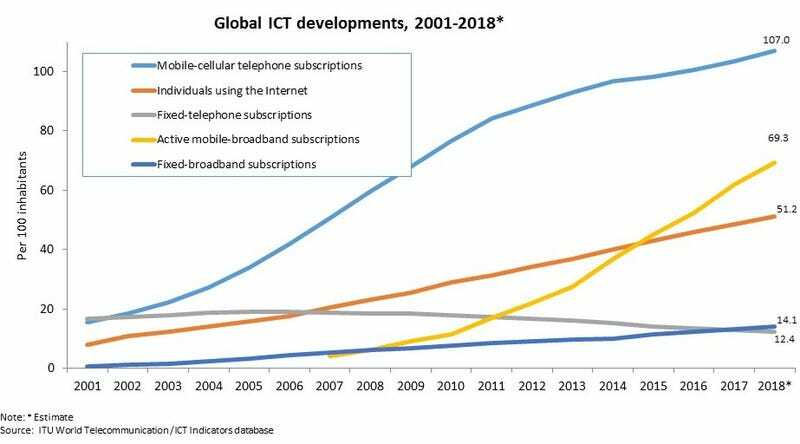 Developed countries went from an estimated 51.3 percent internet use in 2005 to 80.9 percent in 2018. Developing nations went from an estimated 7.7 percent to 45.3 percent in the same timeframe. A huge chunk of that growth comes from mobile internet access, particularly from in the Asia-Pacific region and Africa. The report noted that currently the total number of mobile subscriptions is greater than the entire human population. It also said 96 percent of the world now lives within reach of a cellular network, and 90 percent has access to 3G speeds or greater. Whether this is a good or bad thing depends on your view of the internet. On the one hand, the UN declared in 2016 that internet access is a basic human right. The internet is not only the source of endlessly delightful cat memes and dog photos; it helps galvanize important social and political movements like the Arab Spring and #BlackLivesMatter. It is also why we have terrible Tik Tok compilation videos and you know, the whole Facebook debacle that was 2018. In any case, there’s no going back now.